Darnell: Question, Earl. How do you decide what you�re gonna do next on your list? If it�s too personal, I�ll mind my own beeswax. Earl: Well, sometimes Karma gives me a sign, other times I just pick one at random. Randy: And sometimes he lets me pick, but I get a little freaked out when I play God. That�s why I also don�t vote on American Idol. I've mentioned in the past how I have a track record for typically liking shows that get seem to get prematurely canceled. Sure, there have been exceptions�The Simpsons�but as a rule my "like" pile is littered with too many early deaths to remember, though names like Wonderfalls, Millennium, Huff or Dead Like Me immediately come to mind. 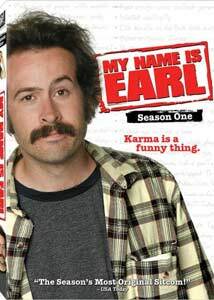 Luckily for me, along came something like NBC's My Name Is Earl, a series that debuted in September 2005 which I just happened to be onboard with from day one, and one that has consistently delivered a steady wave of cleverly trashy laughs. This four disc set of the show's 24 episode first season introduces us to Earl Hickey (Jason Lee), an admitted low-life loser who overnight becomes a good deed doer after an incident involving a lotto ticket, a terrible accident and the divine wisdom of Carson Daly shines down the light of Karma. Earl then puts a list together of everyone he has wronged in his life, and each week he sets out to correct that particular injustice, usually aided by his dim bulb brother Randy (Ethan Suplee) and occasionally by vaguely mysterious motel maid Catalina (Nadine Velazquez). Then there is Earl's gloriously white trash ex-wife Joy (Jaime Pressly) and her laid back new husband Darnell (Eddie Steeples), who serve as foils and compatriots, respectively, along the way. But this isn't just simple trailer park sitcom crap, as it may appear on the surface, because what creator Greg Garcia has come up with is a very tilted and weird comedy that has some of the most quotable one liners since The Simpsons. Lee's Earl actually ends up becoming more of a likeable straight man, wedged in between the spot-on comedic delivery of Ethan Suplee's Randy and Jaime Pressly's Joy, both of which consistently get the funniest throw away lines each episode. And as the plots become exercises in complicated simplicity (Earl trying to repay the government back taxes or replacing a broken "fancy" figurine, for example) the tangents get increasingly bizarre, and that typically means even more quotable gems from Randy and Joy. I think it needs to be mentioned that while the original broadcasts of the episodes incorporated all sorts of popular rock songs as accents, this DVD release has hit a snag when it came to retaining the licensing rights. According to Greg Garcia's blog there were "damn licensing issues with the music in the end so I couldn't use all of them", which means that there are replacement tunes here, which if you're a purist really puts a damper on the completeness of this release. I'm in full agreement from a technical standpoint, but there's still a lot of funny here even without the usage of Bad Company, as much as I wish all of those songs were here. I could ramble on about how funny this show is, but I think the strongest accolade I can come up with would be that as a rule I don't find too many television comedies to actually be comedic. I'm tired of the stock formats, the setup-insult-insult method of writing, and supposedly dysfunctional families chock full of the chubby dad, hot mom, wiseass kids or wacky neighbor. Earl regularly goes for the strange angles�casting Juliette Lewis as a trippy bounty hunter� and even when an episode like The Professor resorts to silly, over-the-top makeup effects to sell a gag, the humor still manages to sell itself. Image Transfer Review: All 24 episodes are presented in 1.78:1 anamorphic widescreen, and unless you watched the series originally in HD, then this will be something new, as the show was seen in 4:3 in standard definition. And as an added plus, it's now possible to see the frequent HD gags that were only visible during the widescreen presentation, such as the "Carl Hickey Loves Hi Def" sign that shows up in Cost Dad The Election. The transfers themselves are quite strong, sporting deep, natural colors and natural fleshtones. There is some modest shimmer and EE occasionally, but in general the image quality carries well-defined edge detail, and this is most certainly an improvement to the standard definition broadcast quality. Audio Transfer Review: Audio comes in Dolby Digital 5.1 surround, and the bulk of the presentation is spread pleasantly across the front channels. Hardly a show-off-your-system mix, with not much in the way of rear channel activity, but voice quality is clean and the overall tone has somewhat more fullness than during its original broadcast. Extras Review: The four disc are packaged in two clear Thinpak cases, inside of a slipcase, and the backcover art for the interior cases has brief plot descriptions and original airdate info. There are eight commentary tracks spread across seven original episodes (plus one for the special DVD bonus ep), all of which feature creator/executive producer Greg Garcia. He's joined by a rotating group, often with producer/director Marc Buckland and actors Jason Lee and Ethan Suplee, while cast members Jaime Pressly, Nadine Velazquez, Eddie Steeples, Giovanni Ribisi, Tim Stack and Jon Favreau appear each to do one commentary. For the Mother's Day-themed Dad's Car, Garcia and Buckland are joined by their own mothers, as well as the moms of Lee and Suplee, and it's a cute touch, or at the very least, different. Befitting the show, the chatter is casual and light, with Garcia casually dismissing the caliber of commentary skills, at one point during White Lie Christmas offering a nickel refund to anyone who buys the set. The bonus ep is Bad Karma: An Earl Misadventure (13m:52s), a DVD exclusive where it's "alternate reality" time, with Earl seeking revenge instead of being helpful. And yes, it's very funny. Making Things Right: Behind-The-Scenes of My Name Is Earl (38m:22s) is a rather comprehensive look at the show's origins, covering the usual bases, but presented in a very low key but enjoyable manner. Rounding out the supplements are the Karma Is A Funny Thing Blooper Reel (19m:59s) and a Soundtrack Promo (:33s), though once again, no mention is made of the music replaced for the DVD release. Each episode is cut into 5 chapters, with optional English, Spanish or French subtitles. I'm a little irritated that a lot of the music originally used on the series has been replaced here, due to rights issues, and even moreso that nowhere is it mentioned on the packaging. If you've seen Earl during its broadcast, you know how well integrated the songs were to a particular scene, so on one hand that really seems to tarnish this release somewhat. And if the absence of certain songs is really going to taint your purist enjoyment of this very funny series, then that's a stand you'll have to take. But the comedy still works, so I have to give this a tempered yet enthusiastic highly recommended rating while I shake my finger at 20th Century Fox for dropping the proverbial ball.